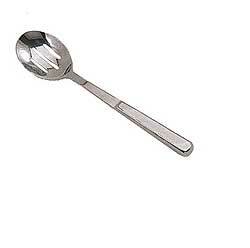 Update International slotted serving spoon features 18/0, 2.5 mm thick stainless steel, with a hollow handle. 11 1/2 inch long. Helps reduce the mess. 18/0, 2.5 mm thick stainless steel. I have been searching for the serving spoon that matches this spoon for three years to replace one that was lost in a fire. It was my favorite spoon because of the size, weight, and the handle fit my hand perfectly. I had found the spoon in a kitchen specialty store for $35 and just couldn't bring myself to pay that much for a spoon. When I found the exact spoon on ABestKitchen.com and saw the price I was sure it wasn't the same quality spoon but at such a low price I had to try it. The spoon arrived in record time and is exactly the same quality spoon that I had before and that cost $35 in the kitchen specialty store. I now have two of the serving spoons, plus the slotted spoon, the ladle, and a set of salad spoons - for about the same price as one spoon from the fancy kitchen store. I highly recommend ABestKitchen.com and their products. See for yourself, you won't be disappointed!